In a previous article we saw how to turn our Kubernetes resource files into configurable templates using kubetpl. This time we will be going a bit further and integrating kubetpl templates into a CircleCI configuration. This is a good way to deploy new versions of your app automatically when new code is pushed. A great start for a Continuous Delivery (CD) system. Alternatively you can create your own image, or simply run the kubectl and kubetpl installation steps directly from your CircleCI configuration. Then, proceed with doing a code checkout and any other steps you might want to do before deployment. For example, if your app's Docker image isn't built and pushed yet you could do this here. Then in your CircleCI configuration file add the following to your job steps, assuming your Kubernetes Cluster config is under the KUBE_CONFIG environment variable. 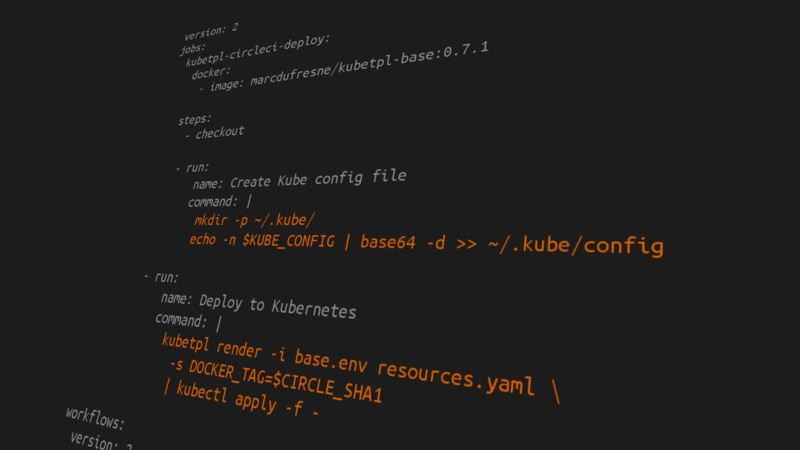 Lastly, now that kubectl is properly configured it's time to render your Kubernetes resource template and apply it to your cluster. The example below does just that and assumes your app's Docker image tag is the commit's hash, which is available under CIRCLE_SHA1. And that's it, your Kubernetes cluster is now updated and your app will be deployed. Additionally, you can repeat the last step for any other template you may have, like Services and Ingresses. You can find the full example of the above files on the blog's examples repo.